Join Lancaster Station & City of Lancaster in the #9PM Routine, lock your cars, valuables and turn lights on! Lancaster Sheriff's Station and the City of Lancaster Urge Our Community to Keep Valuables Safe with the #9PMRoutine. 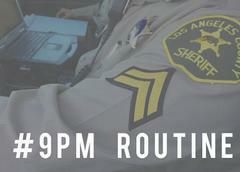 In partnership with the City of Lancaster, the Lancaster Sheriff’s Station is joining other public safety agencies across the county to promote the “#9PMRoutine”, a social media campaign to raise awareness and promote safe habits among residents to prevent unnecessary thefts from vehicles, as well as home and car burglaries. 1. Remove valuables (electronic devices, wallets, etc.) from your vehicle. 2. Ensure that vehicle doors and trunks are locked. 3. Check that all house and property exterior doors and garages are locked. 4. Turn on exterior lights. To join the 9pm Routine and help spread the word to your community, show us your 9pm Routine! Post a picture locking your doors and/or securing your car and hashtag #9PMRoutine to remind your family, friends and neighbors to take these preventative measures. We will select some of our favorite pictures and post them on our social media platforms. Don’t forget to follow Lancaster Sheriff's Station and the City of Lancaster’s social media accounts on Facebook, Twitter and Instagram.